Includes: "Don't Make Me Laugh," "Don't Push Me," "Don't Forget," and more! 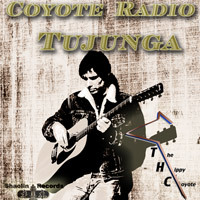 14 songs recorded live in Tujunga 2003 -2005 at Shaolin Records Recording Studio. It started with preparing for gigs and singing his son to sleep every weekday afternoon. We started recording these naptime concerts and ended up with dozens of excellent performances featuring The Hippy Coyote singing while playing his 12-string Alvarez acoustic guitar, with only six strings on it.